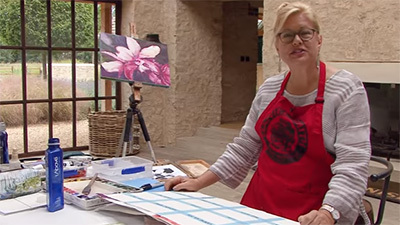 Elizabeth Blackadder's flower paintings are instantly recognisable. Her sensitively rendered multiple blooms achieve a glowing presence within their minimalist backdrops, somehow transcending their individual isolation to create visual relationships and an overall feeling of unity. In The Art of Elizabeth Blackadder RA, Elizabeth first describes how her flower paintings evolve through an intuitive process that allow her ideas to change as each added flower alters the dynamics of the image. 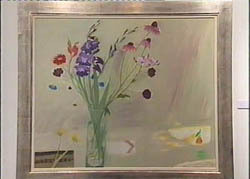 Her first painting, a watercolour, depicts a group of tulips and irises. This combination allows her to show the contrast between the softly textured irises and the shiny, reflective surface of the tulips, necessitating both the wet-in-wet and wet-on-dry techniques. With the later addition of a context for the flowers and some further blooms, I felt she rather overcrowded the composition, which worked well in its more minimal state, although it remained a beautiful image. 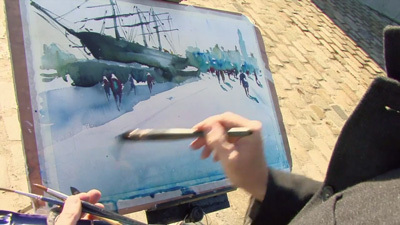 In Blackadder's second painting she turns to oils, where she adopts a completely different approach using a large brush with vigour and fluency. 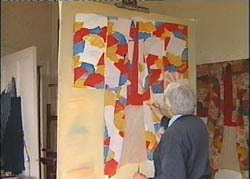 Her subject, a group of buildings in Bologna, is worked up from a simple sketch. 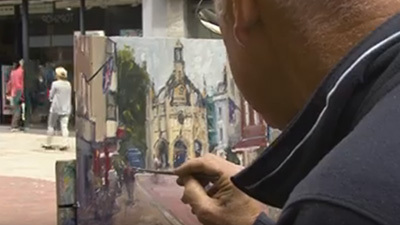 The result has a naive quality which is a huge contrast to her first work. The art of Japan has long fascinated Elizabeth and, after a visit in 1984 the style became prominent in her work. She brought back many artifacts to add to her wonderful collection of pieces from other cultures, which often stimulate new ideas, as in the vibrant painting of a kimono shown in the video. Having seen many scrolls in Tokyo, she has recently begun to make images using their lengthy format, one of which she demonstrates here. She uses various handmade papers from India, China and Japan, letting their textures contribute to the development of her composition. Her scroll paintings are still lifes, but not in the conventional sense of the word. Hers are schematic, reading, she suggests, like a sequence in a passage of music, and with some of the larger areas enlivened through applied gold leaf. 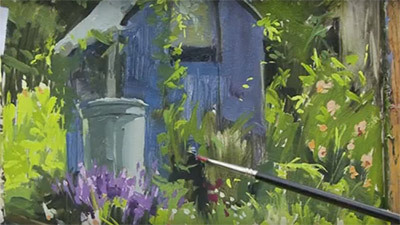 Returning to flowers as the film comes to an end, this time in oils, she creates a more conventional still life based around a dark purple gladioli. 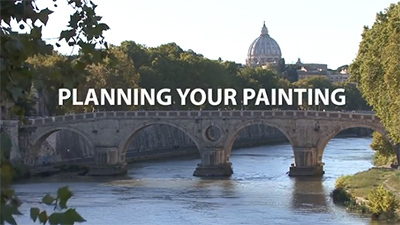 This inspiring film allows us to see an artist of stature explain and demonstrate her unconventional approach. 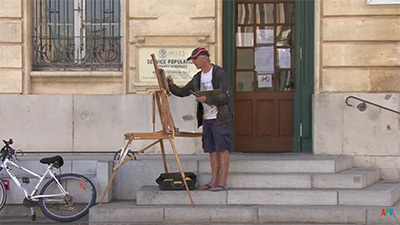 It will encourage any viewer to rethink their own compositions and ideas about painting. 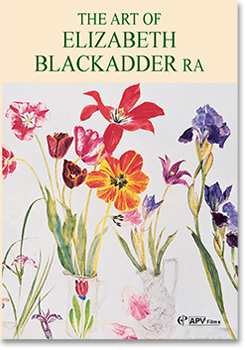 In The Art of Elizabeth Blackadder it is a privilege to watch this exceptional and much respected artist painting in her two studios in Edinburgh, and interesting to hear her talk about her working methods and the kind of ideas and subjects that inspire her. At first sight her work seems very varied and contrasting, from beautifully fresh and realistic flower compositions to oil paintings in which the concepts are dealt with in a more abstract and intuitive way. But diversity is not something she deliberately pursues or necessarily acknowledges. "They are all paintings," she says, "and I am looking for the same kind of solution and exploring the same visual language through them" and in all her paintings she is "hoping to be surprised at the end." 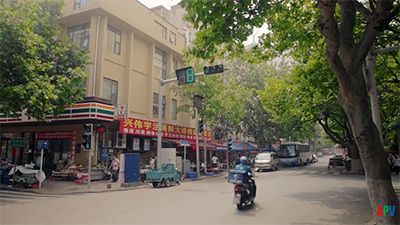 The filming is superb and her highly individual approach is demonstrated in a large watercolour of tulips and irises, oil paintings of buildings in Bologna, flowers in a vase and work on a Japanese scroll.